This is a lovely little Hotel right opposite a fabulous beach. Very Quiet at night but very close to Old Town for great nights out or shopping. Entertainment a little low key just a singer 3 times in the week. The rooms are small & basic, but acceptable, we paid extra for a sea view room & it was well worth it. Food was nothing at all special & became boring during our stay, chips with everything! The bar was only open at set times. Dove park in front of Hotel comes to life during the Evenings with family’s strolling/playing chess or listening to music. Very close to walking street Old Town Approx 5 -10 mins walk at most were you will find more than enough shops, bars, & eating places. But far enough a way to be Quiet at night. We travelled to Benidorm 2 years ago stayed at Levante & Hated it! This time we loved were we were very different from Levante, Going back next year. We stayed at the Mar Blau for New Year 2006. The gala dinner was great with free local wine. Although there were many Spanish Pensioners in the hotel they were friendly & joined in along with all the other guests from Holland, Sweden, England & Wales. The Sea view rooms are excellent. Clean, comfortable & quiet. The dining room & bar-lounge even in December can get warm. All the hotel staff from Cleaners to Reception were helpful & friendly. I had doubts about Benidorm & this hotel but was pleasantly surprised by both old Benidorm & this hotel. The only drawback was the lift, but even there you could practice your Spanish whilst you waited for it, with the other guests & too much food. Too tempting. Just returned from this hotel and would definitely book it again. Small Spanish hotel in Benidorm old town and definitely a hotel for the older generation. We found the hotel to be very clean, and as the weather was poor the week we were there, stayed in most nights, but found the entertainment not bad. Would recommend a sea view, our room was at back of hotel and not much of a view. All in all, I have stayed in much worse hotels that was rated a lot higher. We booked this two star hotel with Portland Direct. I went with my elderly parents who usually book four star accommodation in Benidorm, therefore it was with a lot of apprehension that we booked the Mar Blau. We had no need to worry the hotel was excellent, we had no complaints about anything. In fact this hotel is very underrated, it should be given a minimum of 3 star rating. 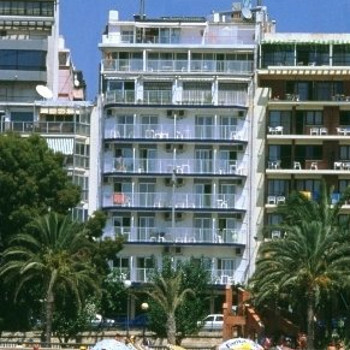 The hotel is situated at the Poniente end of Benidorm about one minutes walk from the old town and as we were there during the fiesta it was a very enjoyable time indeed. Food was excellent, location was excellent, staff were friendly, cleanliness was second to none. The hotel only has fifty rooms so everybody was very friendly, the entertainment was not brilliant but was okay if, like us, you wanted a quiet holiday away from the British end. All in all an excellent hotel and I will be visiting next year, already looking on the internet.